PLEASE NOTE: The following should have been my contribution to Global PR Blog Week...had I finished it in time. Unfortunately, work and life challenged my commitment to this year’s event. Read: I blew the deadline. Many thanks to Constantin Basturea for his unflagging efforts and patience in this matter. It’s called everything from Consumer-Generated Marketing (CGMkt) and Brand Democratization to D-I-Y Marketing and Consumer Controlled Branding. Regardless of what we call it, CGMkt represents the ultimate in authenticity. What better way to promote an iPod than through a customer’s effusive interpretation of the product? When George Masters combined his creativity and passion for his Tiny Machine, he created an ad that brought CGMkt into the spotlight for the first time. Master’s home-made ad was surely not the first of its kind, but it gave CGMkt momentum with 64,000 people seeing the ad in the first few weeks it was online. "It's off-brand but that's the point," Masters said in a Wired interview. "You're not limited by a style guide or a creative director. You can branch out and think different. The ad is special because it's an expression of my love for motion graphics and Apple products." This unprompted expression of love has a powerful impact on other consumers according to brand marketer and trendspotter Piers Fawkes. Fawkes is also a member of the global trends collaborative PSFK Blog. "Folks pick up on the authenticity of brands and want to associate themselves with the brand (and vice versa). They take brand 'content' and recreate it in the way they want, like Google Mash Ups. Consumers also pay homage to brands by creating their take on ads like the iPod." PSFK refers to these consumers as hyperactive consumers or Hyper Users. "Hyper Users use the tools available to them to create new, evolved variations on companies' products, services and even brand communications. The idea is not very new. It's the fact that what was previously considered 'high-end production technologies' are now available to the digital generation video/audio editing software, design software and plenty of tools to capture video, audio and digital images." By creating CGMkt, passionate consumers become an extension of a company. But what if these extended employees are disgruntled? Brand Passion or Brand Poison? 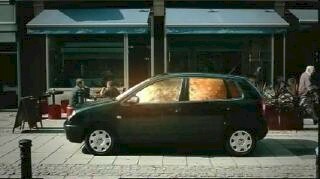 A spoof ad showing a terrorist driving a Volkswagen Polo in a failed suicide bombing made fast tracks across the blogosphere. Volkswagen had nothing to do with the ad of course. The company was, understandably, incensed that their brand was linked to the offensive media file. The professional, high-quality production value of the ad made many wonder whether or not it might be from Volkswagen. Then there is meme of the month, FedExFurniture.com. My issue is not FedEx’ decision, but how they handled it. According to Jose Avila, they merely had to ask nicely. If they had lead with PR or customer service instead of legal, he would have obliged (via Jeremy Pepper). FedEx could have bought an apartment full of furniture for Avila in exchange for meeting their requests and still come out as a blog hero. "It's a dicey proposition for brands to curtail or attempt to regulate consumer use," says Intelliseek Chief Marketing and Client Satisfaction Officer, Pete Blackshaw. "Consumers embed brands into consumer-generated media all the time. Will Pepsi raise questions about consumers sharing digital photos with Pepsi signs in the background? This is a reality brands have to live in. It's part of accepting the fact that consumers are in control. They shape much of the messaging, and brands need to think hard and deep about whether they can influence those outcomes." Avila still uses FedEx. Seth Godin notes, "At the end of the day, this won’t hurt their business." I guess we can forgive the brands we love. The clothing, footwear and consumer electronic brands below that are evoking CGMkt from their customers aren’t too surprising. But there is one golden opportunity in, of all places, insurance. Geico’s Golden Gecko contest asks consumers to submit 15 second movie trailers. The catch? They must feature the little green brand mascot (via Adrants). Alane Golden turned Flickr into his ad portfolio for the trendy retailer American Apparel (via Adrants). Micropersuasion brings us this example of a consumer’s homemade ad paying homage to a recent HP ad. Converse has invited filmmakers, animators and amateurs to create short films in homage to the venerable Chuck Taylor. Each film is part ad and part indie flick, with a great soundtrack. Blackshaw nominates iPod’s Dirty Secret. "It’s negative, but it demonstrates how consumers are turning advertising on its head based on their own real experiences. It also demonstrates how consumers are creating a ‘surveillance culture’ focused on what brands say, do, and promise, and are putting that positioning to the reality torture test." Lucky for Apple that iPods sell like frozen daiquiris in hell. Companies considering the risk and reward of CGMkt should ask themselves some hard questions to determine their level of tolerance and ability to lose control of the message. But even if they decide not to leap onto the bandwagon, they should be aware of the online word of mouth for their brand. Blackshaw recommends integrating this online customer tracking with traditional offline efforts. "It all starts with the call-center and consumer-relations," Blackshaw said. "Brands who win on CGM get things right at that critical moment of truth where consumers elect to talk to the brand. That's the trigger point for virality, goodwill, free media, and CGM or CGMkt. It's also the trigger point for negative virality. Every brand who talks to a consumer should understand their propensity to speak out, to spend time on message boards, or, most important, their likelihood of creating blog. Few brands do this well right now, but we'll see many moving in this direction." This shift considers the impact of viral power on consumer buyer power and represents an opportunity for the public relations industry. "Companies just looking at their web site feedback forms or customer satisfaction surveys won’t identify this profile. The key is developing better segmentation or profiling models to determine the depth of reach and impact of their most vocal consumers. They should know that I am a passionate customer so they can either capitalize on my evangelism or, assuming there is dissatisfaction, make sure my disappointment is handled efficiently and wisely." "Marketing is about understanding the consumer's needs and creating a product/service to satisfy that need," says Fawkes. "The only thing that has changed is the level of consumer involvement in the process." In fact, the companies that will use CGMkt comfortably are those already involving their customers in various processes like product development. If they’re going to be promoting your products, wouldn’t you feel more comfortable if they had input in their development? These extended employees would then be promoting their own product. You’d gladly hand the keys to your marketing department over to them. As long as they turn out the lights when they’re finished and, for pete's sake, make a pot of coffee if they take the last cup. In the early stages of CGMkt, it's fun to watch the good, bad and ugly attempts. But it is the corporate response to these attempts that will impact CGMkt’s adoption and evolution most dramatically. Buzzmachine’s Jeff Jarivs recently posted that "public relations must be about a new relationship with the public, with the public in charge." 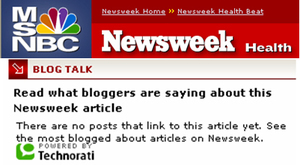 For more on CGMkt, check out Joel Cere’s insightful, and on deadline, contribution to Global PR Blog Week . UPDATE: AdWeek brings us more examples of CGMkt including Pontiac and Ban deodorant in its article "Crowd Control: Handing Creative To The Masses." One interesting quote: "Involving consumers in the creative process goes against the grain of the agency mindset as brand stewards, but the payoff can be more authentic messages." It will be interesting to see which agencies tap into CGMkt and which ones just don't get it. PR Bloggers: Shall we serve cheese with the whine? Since blogs are essentially online op-ed pages, I'm leveling a challenge to every single PR blogger, including myself. I'm weary from reading posts where public relations professionals pontificate to others in the industry about how they are clueless about blogging. Sometimes it seems as if we seemingly lie in wait, eager to pounce on PR people that try blogging, but make mistakes. Mistakes make good meme fodder. Then when the industry makes an effort at learning the rules, we simply respond with more criticism and tell them to learn by doing and start a blog. We all know what can happen if someone creates a blog without looking before they leap. The only thing louder than the buzz around the promise and opportunity held in CGM is the whine from our industry around the need to sit at management's table. It's a classic complaint. Yet when we are put in a position of early adopter, a clear opportunity to offer guidance from a position of authority, we act like children and treat blogging like a club. And, if you need to ask the rules, you can't be a member in this club—unless we like you. Please. If this is how we act over one facet of the social media phenomenon, we should be sitting at the kid's table instead of management's. At the end of the day, we all mean well. If you disagree with this post, just remember it’s leveled at every PR blogger, including myself. Everyone is entitled to their opinion and here is mine: Do unto others. Think Reporters without Borders instead of patronizing posts. Businessweek reviews Wal-Mart's public relations strategy focused on its community, environment and disaster relief efforts. "Can Wal-Mart Wear a White Hat?" is an interesting view behind this massive image turnaround. Dubbed "Action Alley," the office -- as well as a similar one in Washington, D.C. -- acts as the nerve center of the world's largest retailer's campaign to soften its public face. Backed by Wal-Mart's own publicity staff, the team responds within hours to any new blast of criticism. The ability to respond so quickly to criticism tells us that they are tracking the blogosphere. Wal-Mart already has its own blog, Wal-Mart Facts. Edelman practices what it preaches with Richard’s blog, a raft of white papers and a blog research survey underway. So blog tracking is more than likely a crucial part of this response network. The troops also try to spin positive stories about the corporate giant. As they sat facing one another around three tables arranged in a U shape one day in mid-September, Hurricane Katrina was still high on the agenda. Action Alley had scored a bull's-eye after just weeks on the job when it garnered widespread national publicity about Wal-Mart's efficient relief efforts following New Orleans' devastation. Now, in addition to Action Alley, Wal-Mart has opened eight community-relations offices nationwide to answer local criticism. It also has approached two environmental groups and will soon announce a major initiative to curb waste by reducing packaging. In the meantime, Wal-Mart is already focused on Hurricane Rita. Be sure to check out this article. 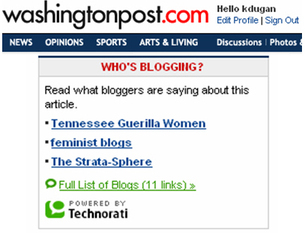 It shows how blogs can help elevate issues quickly to gain widespread attention. In addition to ramping up quickly, all of the content is being catalogued in search engines for the long-term benefits. Wal-Mart should also be buying negative keywords. They can push folks searching on these terms to their blog. It would complement the strategy nicely. Global PR Blog Week is fast upon us. For those who did not experience the first event, bloggers from around the world post on the state of communications technology and its impact on public relations. The second annual PR blogging summit, Global PR Blog Week 2.0, will be held September 19-23, 2005. The forum brings more than 50 influential PR practitioners and bloggers in an online environment to discuss how public relations and business communications are changing from the impact of new communications technologies including, weblogs, podcasting, RSS, and wikis. During this year's five-day forum, participants from Argentina, Canada, Denmark, France, Germany, Ireland, Italy, Netherlands, Romania, Spain, United Kingdom and the United States will publish more than 70 case studies, articles and interviews covering the latest breakthroughs in online technology. For a complete list of participants and conference schedule visit the official Global PR Blog Week 2.0 the web site. Be sure to check it out and subscribe to the RSS feed. TechWeb brings us a gloom and doom research report stating that business to business trade media will see print ad spending decrease due to blog advertising, sponsorship and content opportunities. “Users are finding alternatives to paid trade sources: mostly ad-supported content and user-created content from blogs." OK, this research will come true if business to business publishers react like a deer in the blogosphere’s headlights. But The Washington Post and Newsweek show one way to integrate blogs into online content to being a new, valuable dimension to a print magazine’s online presence. You don’t even have to create a blog in these scenarios. Instead of reading this research, business to business publishers should be defining and analyzing their corners of the blogosphere. All it takes is a few search engines and some quality time online. This foundation will help them create a strategy on how they can integrate consumer-generated media into their publishing models. These ideas are just the tip of the iceberg and everyone involved in the show (publisher, organizer, exhibitor, attendee, non-attendee) can benefit. TechWeb notes “trade companies are likely to continue acquiring online shopping, social networking, and blogging-related companies in an effort to expand their businesses online.” Well trade media is the original niche, or micro, media. Who better to take advantage of the blogosphere? Business to business is near and dear to my heart after 13 years working in this sector. I’m rooting for them. UPDATE: Marketwatch Media Editor Jon Friedman adds jet fuel to my torch for mainstream media (MSM) in his post entitled "Recapturing the vitality of magazines." Give American magazines their due. In recent years, publishers' laziness and lack of innovation have essentially enabled blogs to hijack the intangible buzz that the MSM crave. In fact, the Internet is playing such a profound role in our lives -- while gaining advertising revenue at traditional publishers' expense -- that it has all but driven the MSM into a crouch. Still, magazines occupy a cherished place in our society. Sure, you can print out a page from a Web site and hold it in your hands. And you can put a framed copy on a wall in your home or office. But sorry: A printout won't look as good as the real thing. The American Society of Magazine Editors is celebrating the medium's vitality, relevance and creativity by holding a competition to identify the best 40 covers of the past 40 years. Classic covers can uncannily bring back all kinds of memories and can even herald the beginning of a new era in pop culture. These covers remind us all how much magazines can enrich our lives. 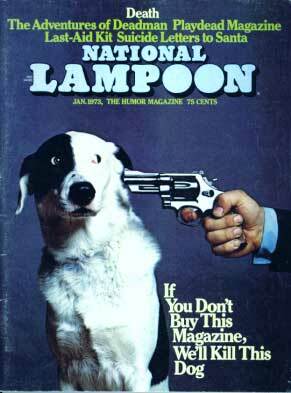 I happily remembered my wayward youth when I saw a hilarious National Lampoon cover from 1973. Unabashedly un-PC, it showed an adorable dog with a pistol pressed against its right ear. The caption said: If you don't buy this magazine, we'll kill this dog. As most of you may should know, For Immediate Release is THE de facto public relations podcast. If you don't listen to it, you should. Hosts Shel Holtz and Neville Hobson have inspired me with their tireless, unflagging passion for the medium. While I’ve been listening to podcasts and following the technology’s uber fast-paced evolution, I’m now considering ways to integrate it into a communications plan. Based on target audience and strategy, it can be a very effective communications channel. There are plenty of ways podcasts might be implemented. Here are just 20 examples. This list is based on a smart (beverage-focused) post from Influx on ways branded podcasts might be used to engage customers. 19. Higher Education: In a recent show, Shel mentions how Duke University uses podcasts to communicate with incoming students and provide them with lectures. Duke University is one of many schools podcasting. 20. Investor Relations: Consider how many earnings webcasts are out there. Consider how much more cost-effective a podcast can be. A podcast also gives the listener several options on how/when/where they listen to it. Shel also mentioned this in his recent presentation about two seconds after I also considered the idea. 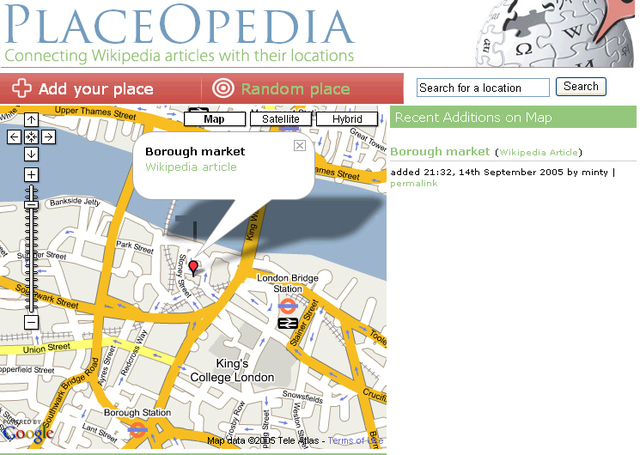 Thanks to Piers Fawkes at PSFK for the Influx link. Steve Jobs: "Podcasting is taking off like a rocket." 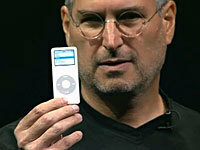 Steve Jobs' introduction of Apple's new Rokr and Nano is now available online. He reveals some interesting factoids on iTunes and iPods. I've reposted them here to underscore the importance of communicators' considering how/if these two fast-emerging, communications channels might fit in their own efforts. More on this topic here. * The average iTunes customer purchases 60 songs. * Podcasting technology has been around for one year. * After offering podcasts on iTunes for two months, it has 7 million podcast subscriptions. * iTunes offers 15,000 podcasts and adds 1,000 new podcasts each week. * 30% of cars will offer iPod connectivity in the US in 2006. This is HUGE for podcasting. * 1/3 the size of the smallest phone on the market and it carries all the features of an iPod. Anyone on Yahoo! this weekend probably saw the Huggies Baby Network banner. It was hard to miss based on its frequency and the close up of a woman's very pregnant tummy. As a father of a six-month-old, I'm the perfect target market for a diaper ad and, as a self-confessed nerd; I'm intrigued by the concept of an online "Baby Network." Then I clicked on the banner. The site tries to compete with BabyCenter. BabyCenter offers very intelligent e-mail newsletters that are customized to each parent from preconception through 24 months. The e-mails track development, share tips and serve up content from other community members. BabyCenter's main consumer-generated media components are a bulletin board and chat component. There is also e-commerce. I joined BabyCenter when we were pregnant with our first and I highly recommend this site. The Huggies Baby Network design is great and it appears packed with content. Upon closer review, however, its goal is to be an also-ran. The site offers articles from content partners, including BabyCenter. The text of each article is on the site and each source is cited, but there are NO links back to the partner's site. Read: They don't get it and want to keep you on their site. The network has one or two interactive tools, but it really misses the consumer-generated media opportunity. Parents these days are wired, toting cell phones, digital cameras and have most likely dipped their browsers into the blogosphere. Yet Huggies offers no blog (hint: pediatrician?! product experts?! baby book author?!). There is a photo album application, but they should host a gallery contest where proud parents can post pictures of their children and compete for a prize (free Huggies products of course). Child care podcasts might make those night feedings go more quickly (with headphones of course). Adding consumer-generated media opportunities to the Huggies site would help differentiate it and give users a new reason to join and visit often. Goofus goes to Huggies for trying to compete with BabyCenter by copying them. Gallant goes to BabyCenter for setting the standard. This is also the perfect segue to congratulate BlogPulse CMO Pete Blackshaw and his wife on the birth of their TWINS! Everyone is doing great. The only problem is that Pete won't stop blogging from the hospital and they still have not named their babies. Trend blog PSFK tells us of the "first blogger ever to be sponsored by a fashion brand." MarketingShift's Jason Dowdell will be sporting Apostle Clothing when you see him next. The new, underground brand already sponsors BMX riders and skateboard pros. Bloggers seem like a natural extension and Dowdell is tight with one of Apostle's owners. The deal works out for both parties, but it's pretty surreal to see a blogger monetizing his efforts in this, um, fashion. oneword: You are given a single word, along with sixty seconds, and you write about the word. After you post, you can review other submissions and a new word is chosen daily. onecaption: One word not enough for you? Try a thousand at onecaption. Same concept...with a picture to inspire you. My Favorite Word: Review visitor-submitted content, listed in alphabetical order of course. My favorite word is penultimate. It means second to last. Placing second to last in a competition could be the worst spot of all in which to finish. Even dead last has some level of celebrity attached to it – albeit unwelcome. IMHO, the word sounds cool to help soften the blow. Speaking of visitor-submitted content, Wikipedia should start ranking their most popular entries and the entries with most contributors/edits. 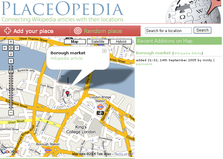 This would offer readers another way to browse the site. UPDATE: Here are two more sites that fit into the word choice exercise discussed above. 50 Word Fiction: Stop by to see the shortest of stories. Better yet, create your own. Mobile Phone Writing Contest: Shanghai Literature and Art Publishing House just held a contest requiring contestants to create and submit their written work via SMS. The challenge is that each submission must be 350 words of less. A typical, short message can carry 70 Chinese characters. Hat top to Piers Fawkes at PSFK for the link. Can Your Content Capture the Consumers' 8-Second Attention Span? Do You Follow the 6 Content Curation Principles? What's the Key to Social Sharing?